The Subud World Congress in Puebla - an inner and outer space to meet in our wonderful diversity. Our sharing the Latihan touches our inner gifts and talents, encouraging us to let them emerge and flow freely. One of the main gifts of this inner attitude is the possibility to learn to live in peace - with ourselves and with those around us. Peace and understanding start within ourselves and the education of our children - so to be able to shift us to a truly human culture. Our aim with this zone4peace is to create a space and atmosphere of inspiration, interaction and dialogue. Arts and creative work always have had the power to open up and transcend borders, to enhance mutual understanding and respect - combined with joy and celebration. This is where the „Poems for Peace“ Initiative wants to inspire and encourage us to engage ourselves in this process. We envision a vibrant and joyous evening, where out of compassion, forgiveness and commitment to each other, beautiful artistry of words and vision. 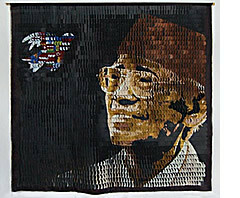 It has the power to enrich and enliven our human spirit, broadening the understanding of ourselves and each other. This extraordinary diversity of cultures, languages and religions was present in Wolfsburg to share and celebrate its unity and connection, overcoming its belief systems and different views on life - understanding diversity in culture and language as an enrichment of their own life. Germany - being the host country - having on one side a deep relationship and understanding for poetry and lyrics but on the other as well the burden of the German responsibility for the Second World War. This gave the gathering in Germany a special momentum for asking for forgiveness and having the inner strength to take up the responsibility to carry the light of peace, compassion and understanding into the future. Now it is time to carry these words and music to Puebla to share with our brothers and sisters worldwide. Just looking at the actual serious situations in Syria and the Ukraine reminds us to take action and show our solidarity asking for peace and forgiveness. For August 6th, we will make an entry call for poems, prayers and short stories on peace - either in words or visual creativity. Peace in all its multifaceted aspects will be the theme: peace within ourselves (the core place to start), peace within our family, our community and our neighboring countries. Peace can be expressed in so many ways - we will focus on words and music - at the same time also want to encourage painters and photographers to contribute their visual poetry. We want to give space to explore our talents and express our connectedness in many different ways, fostering peace and true harmony, a message to be taken home to all the participating countries. Besides leaving an imprint of „creativity in peace“ in Puebla, we hope to leave this imprint in all the participants hearts, to take back home to their countries to be connected again on September 21st, the worldwide celebration of PeaceOneDay. SICA’s "Poems for Peace” initiative is our inspiration for this project. Every year, on September 21st, there is a worldwide celebration of Peace Day. It began with a UN resolution in 1981. In 2001, through the efforts of Peace One Day, a UK based nonprofit, the UN resolved that Peace Day also be a day for wide scale community action to celebrate peace. Last year, Peace One Day invited NGOs from around the world to join with them to make a truly global celebration of peace, and SICA joined this effort — encouraging Subud members and their communities from all over the world to participate. “This is about actively sharing one's love of peace through poetry." says Latifah Taormina, SICA's Board President. "Poems live in our music, our holy books and in our hearts. Poems for Peace is an invitation to connect to that place inside us all and share your favorite poems — wherever you are — on Peace Day." In the testing about the significance and meaning of this years’ Zone4 gathering, a feeling of forgiveness and peace was very strong — as the source of true joy and happiness. So it was just small step to embrace the SICA initiative and to plant the seeds in the ground of our hearts for the celebrations on the 21st of September 2013. Our Zone4 is one of incredible diversity: it covers central and eastern Europe, Scandinavia, northern Asia and part of the Middle East - with Scandinavia in the North and Greece, Israel, Lebanon and Turkey in the South to Russia and the Ukraine in the East. This extraordinary diversity of cultures, languages and religions will be present in Wolfsburg to share and celebrate our unity and connectedness, overcoming our belief systems and different views on life — understanding diversity in culture and language as an enrichment of our own culture and life. In Germany, we have a deep feeling for poetry, music and art. At the same time we bear the burden of our history, having committed atrocities against our fellow human brothers and sisters in Germany as well as in our neighboring countries. We believe that asking for forgiveness gives us the inner strength to take on the responsibility to carry the light of peace, compassion and understanding into the future. What better place to do this than in Wolfsburg, a city which has made an enormous development in its own awareness of itself as a city enriched by cultural diversity and mutual understanding. The arts have always had the power to open up and transcend borders, to foster and enhance mutual understanding and respect, combined with joy and celebration. If we are to develop into a truly human culture, peace and understanding must start within ourselves. Our aim is to create a space and an atmosphere for encounter, interaction and dialogue. Peace in all its multifaceted aspects will be the theme: peace within ourselves (the core place to start), peace within our family, within our community and with our neighboring countries. Peace can be expressed in so many ways. We will focus on words and music — while at the same time encourage painters and photographers to contribute their visual poetry. We want to provide space to explore our talents and express our inter-connectedness in many different ways, fostering peace and true harmony, a message to be taken home to the Zone4 member countries. Peace is a daily, life-long quest- for all of us. If you would like to express your vision of peace through art and creativity — as a poet, a poetry lover, a singer, an actor, a dancer or an artist who writes his poetry with colors and light — share your poetry with us! Join us in our gathering with readings, performances, workshops, exhibits, concerts. 5 days of celebrating the diversity and richness of the cultures of our 24 countries of Subud Zone4 — and hopefully the cultures of our neighboring countries in Zone3 and many more! Let us embark on this journey without a concrete plan — with just a framework— to see where this venture will lead us. We hope to create a space where the unifying spirit of the Latihan touches our inner gifts and talents, encouraging us to let them emerge and flow freely. We envision a vibrant and joyous gathering inspired by compassion, forgiveness and commitment to each other, from which the beautiful artistry of words and vision can arise to foster projects and enterprises for working together across borders, both inner and outer. Let us creatively enrich our human spirit and broaden our understanding of each other by putting the Latihan into practice in this world. 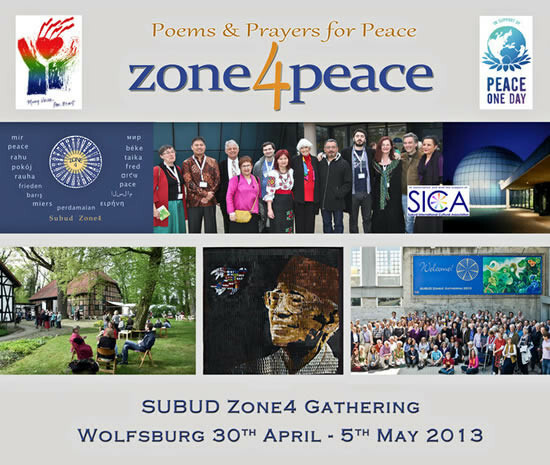 This SICA initiative "Poems for Peace - Peace One Day“ inspired a project at the Zone4 gathering in Wolfsburg in 2013: an evening with poems and music recited and sung in the native languages from many of the countries of Zone4. The Subud Zone4 covers central and eastern Europe, Scandinavia, northern Asia and part of the Middle East - with Scandinavia in the North and Greece, Israel, Lebanon and Turkey in the South to Russia and the Ukraine in the East. As preparations for the Zone4 Gathering progressed and as the number of countries and participants expanded, the central themes of the meeting “enterprises” and “peace & forgiveness” started to gently seep into full consciousness. It became obvious to me, as a German that I wanted to contribute to the spirit of peace & forgiveness. Nurtured by a feeling, which Ismanah had, in her own words, already accentuated on the Zone4 website: to humbly pacify the monstrosities of the past, to soothe the grief that walks hand in hand with guilt, to enlighten the shadows of the past that still reach out to the present.